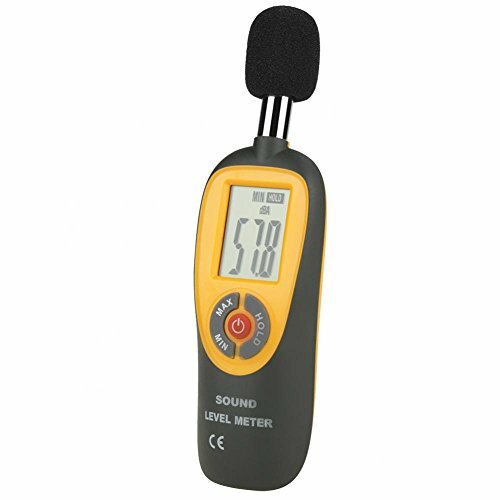 The sound level meter is designed according to health and measurement requirement of industrial safety. It can be used for noise measurement in all types of occasions such as offices, families, factories, hospitals and schools. Maximum value hold, minimum value hold and current value three states are switchable by simply pressing a button. Designed with tripod hole, the sound level meter can be fixed on the tripod. Support automatic power off function after 16 minutes no operation to save power. HIGH QUALITY - The sound level meter is designed according to health and measurement requirement of industrial safety. EASY TO USE - Maximum value hold, minimum value hold and current value three states are switchable by simply pressing a button. ACCURATE MEASUREMENT - It measures range from 30 - 130 dB with frequency range from 31.5 to 8Khz. Highly accurate with +/-1.5dB. WIDE RANGES - Used for noise measurement in all types of occasions such as offices, families, factories, hospitals and schools.